This was originally published on the Quint and is reposted here with permission. 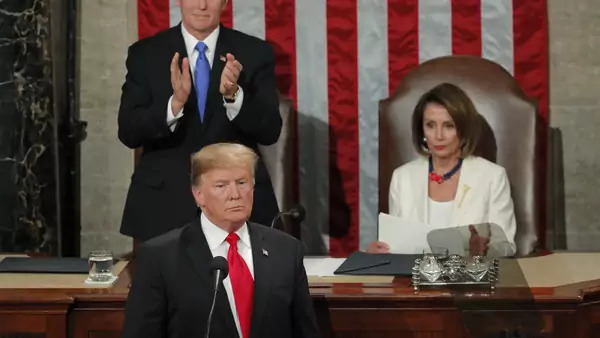 For a speech that US President Donald J Trump told supporters was likely to contain as much as “40 to 50 percent” foreign policy, the actual State of the Union address gave foreign policy short shrift. As Trudy Rubin of the Philadelphia Inquirer noted, the foreign policy part of the speech comprised around sixteen minutes of the nearly ninety-minute address. But given the large landscape of foreign policy issues Donald Trump could have presented for the American people to assess, it was more than a little surprising to hear the limited scope: leaving the INF Treaty, bringing troops home from Syria and Afghanistan, the next summit with Kim Jong-Un, the trade war with China, and brief sentences about Venezuela, moving the US Embassy to Jerusalem, and withdrawal from the Joint Comprehensive Plan of Action with Iran. These are all important, certainly, but so are many other priorities crucial to US national security—and about which the Trump administration has said much more, in other contexts. True, Trump featured pet campaign themes of the alleged immigration crisis on the southern border (which is not a traditional foreign policy issue), trade negotiations (with China, Canada, and Mexico), and NATO allies treating the United States “very unfairly.” He honoured US World War II veterans, a gracious moment. Trump spoke about Afghanistan and the present effort to see if a negotiated peace with the Taliban could be achieved. This part of the speech could have been more extensive, especially given that the US deployment in Afghanistan is now in its eighteenth year, the United States’ longest war. It remains unclear whether and under what circumstances an agreement with the Taliban might be reached, and whether that agreement will prove acceptable to the sitting Afghan government. A word about regional security might have provided more clarity on why this situation remains fiendishly complex after all these years, and could have provided greater recognition of the trials those US troops face who have served there. It could also have been a moment to recognise the roles of NATO allies and partners serving as well, and important contributors to Afghanistan like India and Japan. The president’s lack of attention to the security challenge China presents—one of the two countries his own National Security Strategy names as geopolitical competitors—was puzzling. To the extent China appeared in the address, which it did, the context revolved entirely around trade. But his own administration has developed a policy framework that takes China’s increasing assertiveness across the larger Indo-Pacific region and indeed across the technology and commercial spaces as security challenges. It’s called the Free and Open Indo-Pacific Strategy. It’s true that the president has not personally served as messenger for the more extensive statements about the Free and Open Indo-Pacific, leaving that to Vice President Mike Pence, or his secretaries of state (Rex Tillerson, and now Mike Pompeo). But the Free and Open Indo-Pacific, to the extent that its details have been unfurled, has largely garnered support from both sides of the aisle and for that reason alone would have been useful to highlight, especially given the president’s desire to present a “unity” address. We heard little, for example, about the important diplomatic work underway to respond to the Belt and Road Initiative around the world. For example, the Trump administration has revived the Quadrilateral consultations among four great democracies—Australia, India, Japan, and the United States. Nor did we hear anything about the recently-passed BUILD Act (Better Utilization of Investments Leading to Development), which enjoyed great bipartisan support on Capitol Hill. This new law rescued the functions of the Overseas Private Investment Corporation by creating a new consolidated International Development Finance Corp, and doubling its finance capacity to USD 60 billion. It will help the United States remain competitive in the infrastructure finance space, especially in the Belt and Road era. Most usefully, the new agency gives the US government an important tool to help mobilise private capital by underwriting risk. Finally, in what appeared to be a brief reference to a forthcoming development assistance program, the president offered one sentence about a new initiative focused on economic empowerment of women in developing countries. He then pivoted immediately to “calamitous trade policies” and the trade war with China, an utterly confusing shift. It would have been good to hear more about how the Trump administration plans to help increase economic opportunity for women in developing countries, and indeed where specifically this new initiative will focus. But the president chose not to elaborate on these foreign policy concerns. The foreign policy speech he didn’t deliver could have had some bipartisan wins and a greater sense of unity across these national security priorities. Too bad he didn’t give it.